Every season, for at least a week or two, the media acts like the Texas Longhorns are the new team to beat. They act like the once-proud program is set to become one of the elite teams in the nation once again. After getting embarrassed by Maryland, it looked like all the big talk was going to die down quickly this season. But then they dismantled USC with ease and took down a tough TCU team before heading to Manhattan to take on the Kansas State Wildcats. But after rattling off three wins in a row at home including two over ranked opponents, could they get it done on the road? The Longhorns got the job done in every facet of the game in the first half. D’Shawn Jamison got the team off to a good start with a 90-yard punt return for a touchdown early in the first quarter. 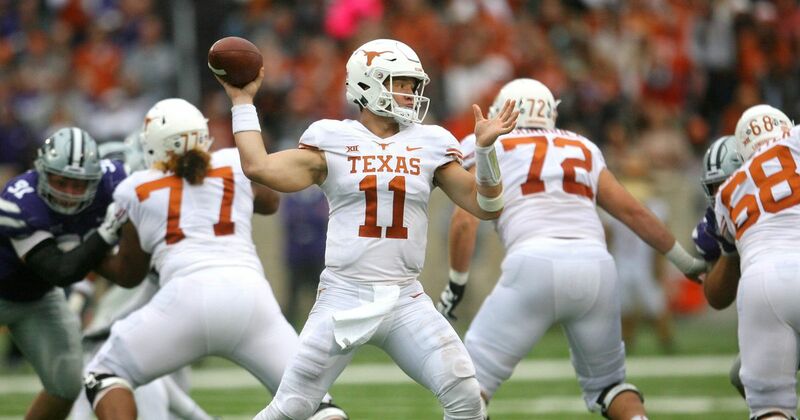 Sam Ehlinger extended the lead to 14-0 early in the second when he connected with Collin Johnson on a four-yard touchdown pass. Charles Omenihu got the defense in on the action on the next drive for the Wildcats. He sacked Alex Delton for a safety bumping the Texas lead up to 16-0. Texas would tack on a field goal before the end of the first half making the score 19-0 at the break. In the first two quarters, all seemed right in the world for the Longhorns. Every facet of the game looked incredible. If they could keep it up, maybe it is time for the rest of college football to start paying attention to the Longhorns again. But then the second half happened. Kansas State switched quarterbacks at the half and changed the complexion of the game. Skylar Thompson was able to get the ball moving on the opening drive. He got the Wildcats on the board with a seven-yard run to cap off a ten-play, 82-yard drive. Texas had a chance to extend their lead later in the third but missed a 47-yard field goal. On their next drive, Thompson led the Wildcats on a 16-play march. Alex Barnes capped it off by taking it in from one-yard out on fourth and goal. “We rallied together as a team and came out with a different mentality than we did in the first half,” Kansas State linebacker Justin Hughes said after the game. But Kansas State would only get the ball one more time, and the Longhorns forced a three and out. The loss drops the Wildcats to 2-3 on the season. They’ll head to Waco next week to take on the Baylor Bears. With the win, Texas improves to 4-1 on the season. Does this mean the Longhorns are back? Fans will find out next week when they take on the Oklahoma Sooners in the Red River Rivalry.